Dear Parnter, you are invited to meet the MeLE team at the 2013 International Consumer Electronics Show in Las Vegas. 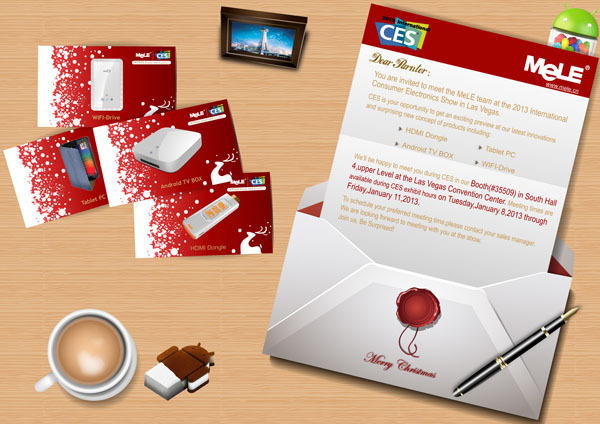 CES is your opportunity to get an exciting preview at our latest innovations and surprising new concept of products including: HDMI Dongle,Tablet PC,Android TV BOX, WIFI-Drive. We’ll be happy to meet you during CES in our Booth(#35509) in South Hall 4,upper Level at the Las Vegas Convention Center. Meeting times are available during CES exhibit hours on Tuesday ,January 8,2013 through Friday, January 11,2013.To schedule your preferred meeting time , please contact your sales manager or contact Coco Jiang（sales8@mele.cn）. We are looking forward to meeting with you at the show.